Lhasa City, capital of southwest China's Tibet Autonomous Region, began celebrating the annual Shoton Festival on Monday. 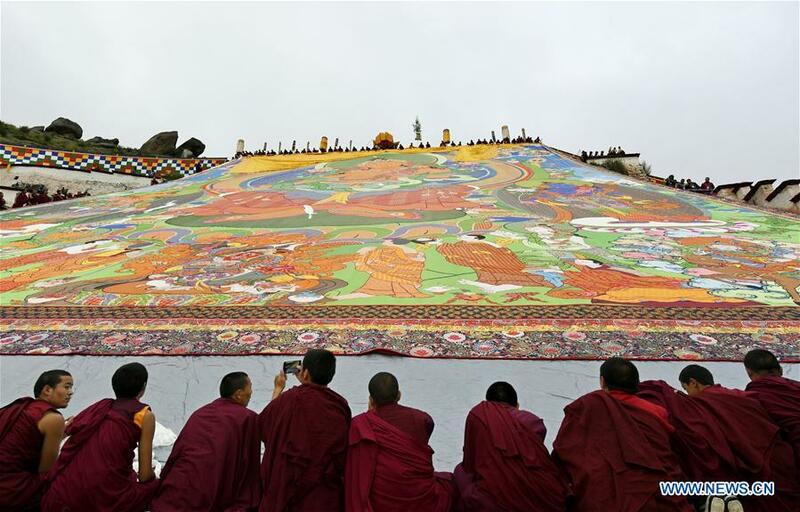 The event began amid a drizzle at Drepung Monastery, the largest monastery of Tibetan Buddhism's Gelug Sect, where a large thangka painting of the Buddha was on display. 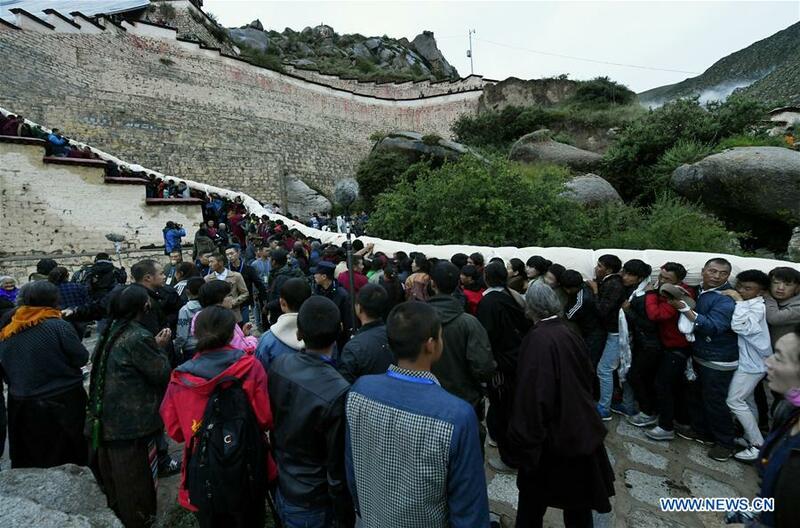 At 7:10 a.m., monks and believers moved the painting from the great hall of the monastery to the exhibition stage as thousands of people watched on the winding mountain road. A man in his 30s named Kunga took his wife and daughter to the Buddha exhibition. Kunga and his family woke up at 5 a.m. at their home in Lhasa's Liuwu New District. "I'm busy with my business and the child is busy at school. It's good to spend some time with her during the festival," said Kunga. 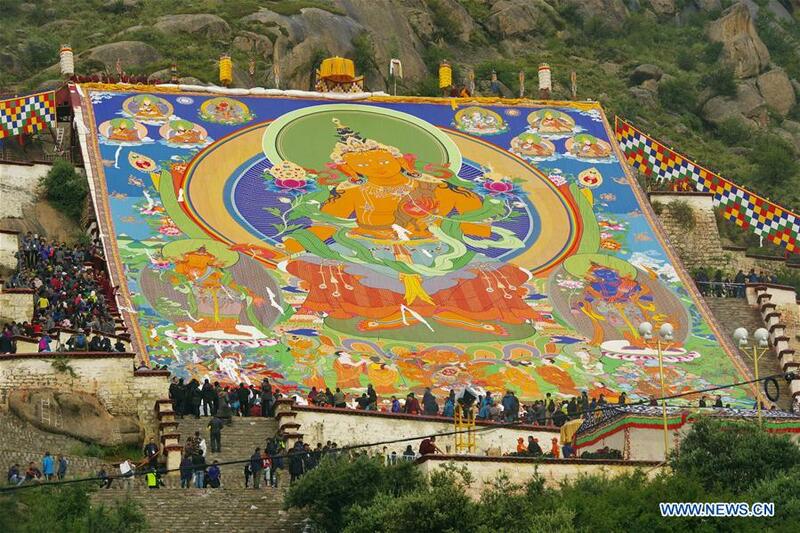 He said the Shoton Festival is the second most popular festival in Lhasa, only following the Tibetan New Year. Before the Qinghai-Tibet Railway opened in 2006, Kunga was a farmer living on the outskirts of Lhasa. Since then, the district has developed into one of the most prosperous areas in Lhasa, and Kunga now runs a grocery store there. The Buddha exhibition is an important occasion for elderly Tibetans. "My husband and I came here last night. 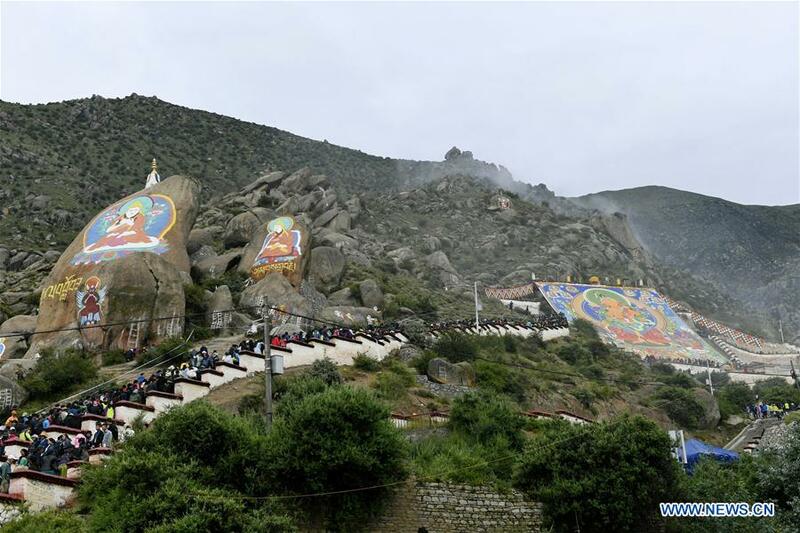 After worshipping the thangka, we will go to the Sera Monastery and watch Tibetan opera for several days before returning home," said 70-year-old Rinqen Wangmo from Nagarze, Shannan City. The couple spent the night on a wool pad in front of the great hall. Tibetan opera performances are another must-see at the Shoton Festival. Dating back to the 14th century, the performance style epitomizes Tibetan culture, combining dance, chanting and songs, and the region's famed painted masks. It was awarded national intangible cultural heritage status in 2006 and was added to the UNESCO World Heritage List in 2009. "The legends the operas tell are well-known among Tibetans. Although we young people can't understand every line like the older generation, we're familiar with every character. I hope my child can learn more about the opera, so I will take her to the show," Kunga said. In addition to exhibitions, Tibetan opera performances and Tibetan equestrianism, the week-long festival will also include hiking, yogurt-eating and beer-drinking contests, and a Tibetan-style fashion show. The Shoton Festival, also known as the Yogurt Banquet Festival, has been held since the 11th century. It was originally a religious occasion when locals would offer yogurt to monks who had finished meditation retreats. In the first half of 2017, Lhasa received about 3.86 million domestic and foreign tourists, a year-on-year increase of 18.21 percent, generating tourism revenue of about 5.1 billion yuan (764 million U.S. dollars).